This entry was posted in Attempt at a Review, Favorite Perfumes, Perfume News and tagged gardenia, Hothouse Flower, Ineke. Bookmark the permalink. Oh, no, Hothouse Flower doesn’t smell of an apple. It was more of a feeling when I tried to explain how it’s different from those perfumes that traditionally are called “green”. I don’t think this brand is available anywhere close to where you live so unless you get it in a friendly swap for you chasing it probably won’t make much sense. But if you get a chance, try at least some of this line’s perfumes – you might find something you like and they aren’t too expensive. Gardenia can be lovely if done right. Thanks for the tip on the sample pack! I think it’s the second best sample pack I’ve ever seen (after Ormonde Jayne’s discovery set): you should see attention to details! I think that this sample pack might be a good gift for somebody you want to give a gift of perfume but not sure what they would like. This set plus a gift card with the difference for the full bottle purchase. 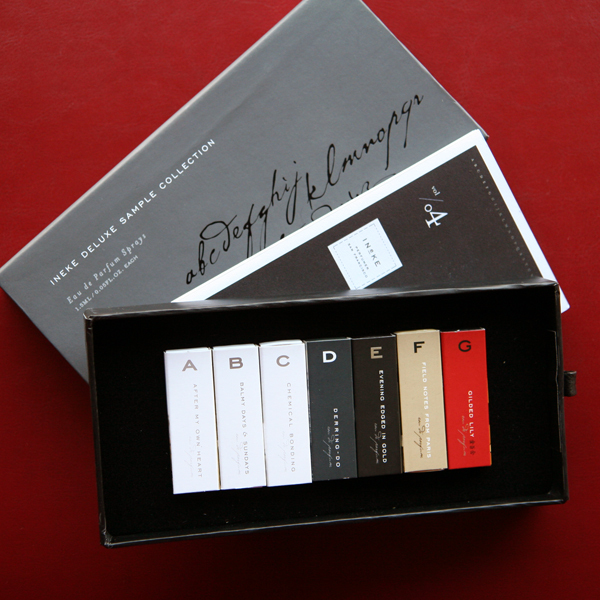 Ineke seems like a great house – I’ve only tried Field Notes, so don’t know much about the others. They all seem very floral, and I suspect I might struggle to pull off some of them. On the subject of Gardenia, we had a bush growing in our garden when I was a child (not in England) and I was always entranced by it. The smell is very lush and intoxicating, but not as in-your-face as tropical flowers like frangipani can be. The flowers themselves are fabulous – ivory white, silky smooth yet waxy, delicate (they bruise easily). Michael, just to give you a heads-up, not all of her scents are floral. Balmy Days and Sundays is a green, Chemical Bonding is a citrus, and Derring-Do a fougere. Dionne is right, there are different scents in the collection. Field Noted From Paris is my favorite perfume (and my only full bottle) from the line. Ok, thanks for the clarification. Perhaps I should have a closer look. I was quite looking forward to this release, it doesn’t quite sound like I’d hoped – but then, I hadn’t read much about it anyway. Glad you enjoyed it. Unfortunately I haven’t had success with the Ineke line so far – which is a shame becuase I adoreeee the bottles so much. Some of the nicest out there IMO. I have to say that nowadays, when I find that I do not like some brand in general, I do not get upset: it’s one less brand to test/lemming for/ etc. My favorites from the line are Field Notes from Paris and Evening Edged in Gold. And now this new one. So probably if you remember what your reaction to those two were you can extrapolate and predict your reaction. GRRRR They don’t send Down Under! Yeah, this is a culprit: they ship only to the U.S.
Like all the notes except gardenia! Have never tried an Ineke, though Field Notes From Paris is on my to-try list. If you are in the U.S. consider a sample set: 2 ml sample of FNFP from Surrender to Chance costs $5.95 + $2.95 S&H. I loooove Ineke’s packaging. I am going to do the sample set soon, I think. I should be getting this sample in the mail some time soon. Really looking forward to trying it! My sample should be arriving sometime soon as well, and now I’m intrigued. I’ve only tried perfumes with gardenia twice (ELPC Tuberose Gardenia and Iris Nobile) but I like them both. And I’m a big fan of the fantastic little touches Ineke brings to her line, the bottles are especially stunning. I adore gardenia in nature ( mine just finished a second bloom this summer! 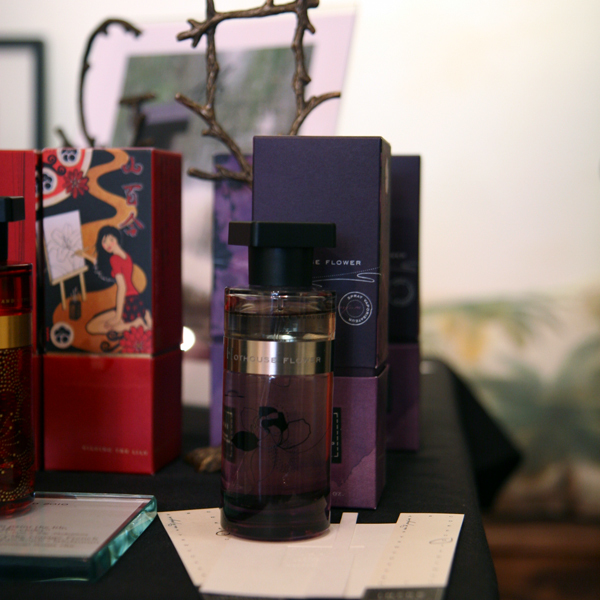 ), but I often don’t warm up to it (or to tuberose) in perfume. I do love Ineke, though.Gorgeous bottles, and I love the names, their alphabetical order. FNFP is my favorite: lots-o-patchouli. I like Chemical Bonding,too. It is a sneaky one–starts out citrus, turns floral, and just when you think the shifting is over, there’s that complex, vetiver-blend base. EEIG was a bit too candied for me. I can stand tuberose only in homeopathic doses but I like gardenia. Chemical Bonding reminds me a lot of DKNY Woman that I used to like but over-used at some point. Uh-oh! More gardenia! :) I do not have amazing luck with Ineke perfumes (respect them, but most are not “me”), but I will have to try this. I normally have a problem with gardenia perfumes but the note list for this sounds wonderful and I like the idea of a an apple green setting. If you happen to try Jo Loves’ Gardenia (which I also like) – Hothouse Flower is much less gardenia and much more green. It really looks wonderful. I grew up in So. California and Gardinias were everywhere. I love the flower. We really need to get you one to smell. Great review! I love the Ineke sample set. Field Notes From Paris is my favorite. FNFP is my favorite as well! I think once they launch you’ll be able to try it at SF Nordstrom (Westfield) – they carry Ineke line. Thanks I will be jetting downtwown this weekend! Then I shall go downtown twice! If you happen to be at Neiman Marcus, can you check if they carry there new Ramon Monegal line? I see it on their website but it doesn’t mean that all stores carry it. num, now i want to try. i already own the sample set, though! Have you bought it from Ineke’s site or somewhere else? If from them but long ago I’d suggest writing to them and asking to buy a sample directlysince they’ll send it automatically only to those who bought a full bottle or a sample set but in the recent couple of months. Oh, I bought it sometime in 2011, I think – at Henri Bendel. It was at Sniffapalooza, and the gift with purchase was the G perfume, as the box set only contained through F. :-) I’m sure a sample of this will come my way at some point. I’m much less eager to acquire full bottles these days, so that’s fine. It does sound right up my alley. I have no will power some days. I read this review the other day and I was intrigued but resisted the urge. Then I saw another review of an Ineke scent on another blog and between the two reviews I was helpless to resist. I ordered the sample set. Good for you! I really hope you’ll find at least one you like enough to go for a full bottle. And if not, I’m sure that set will be an easy swap item. Gardenia just finished blooming. I had whopping 3 flowers this year. Come over – I’ll show you its leaves. You can also buy them at the flower market. The most loved by wedding florists are “funeral gardenias” called so because they are short-lived, inexpensive, but fragrant and look romantic. Incidentally, I bought the Ineke’s sample set for its charming package – this prompted me to rightfully leave this comment. I rather wonder what frankincense is. Here you go – all you want to know about frankincense and then some. Let me know when your gardenia blooms again – I’ll definitely want to smell it. ладан? Sorry, I was lazy to look it up – the word seemed more enticing and promising than this. I lemminged the sample set, ordered on Sunday and got it today! As you said, it is great; kinda reminds me of the Ormonde Jayne Discovery Set, only smaller. This set is so well done that If I had a business where it is acceptable to send gifts to clients, I would select this as a gift — it looks very luxurious and worth way more than what I paid for it. Now I need to spend time with it to decide which ones, if any, are FB-worthy. Ineke’s set was my very first sample set and Ormonde Jayne’s – the second after that so in my mind I also have that parallel. I hope you’ll find a FBW perfume among those.